Even the word is beautiful. Internet bicycle-guru Sheldon Brown defined a mixte (pronounced 'mix-ty' in English, 'meext' for the Francophiles) as a "frame in which the "top tube" consists of a pair of small diameter tubes running more-or-less straight from the upper head lug, past the seat tube, and on to the rear fork ends." But truly, a mixte is so much more. It's a bike that's at once elegant and efficient. It's clean and distinctive. It's feminine and strong. It's versatile and unique. In the past decade mixtes have regained popularity, with several bicycle manufacturers now making their own versions. Most of these new mixte are built up as city bikes that are lovely and quite comfortable, but often heavy and on the slower side, best taken out for short (1-3 mile) rides. 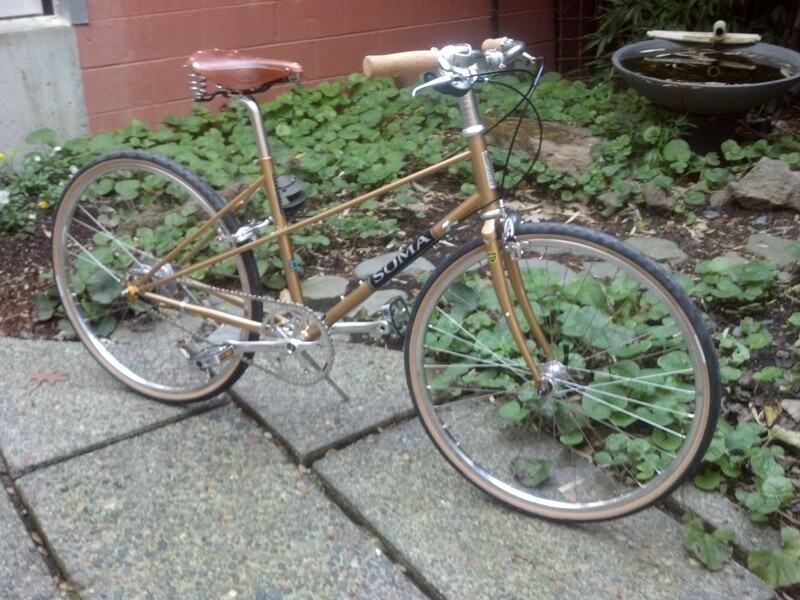 However, the Soma Buena Vista mixte frame we used to build up this bike is not your average mixte. This frame is designed to be lightweight, stable and speedy means. This mixte is versitile - - it can be built up just as well with upright bars and a rack as it can with drop bars and fast, lightweight wheels. Also, in case you didn't notice, it's gold. Swoon. The Soma Buena Vista is sold only as a frame set, not as a complete bike. This means that this bike can effectively be whatever you want it to be. Speed machine? Sure. Grocery-getter? Definitely. Light touring rig? Why not! The sky is the limit with this one. C'mon in to take this floor model out for a test ride and then begin dreaming about your very own semi-custom build.